Great night celebrating Didsbury Civic Centre’s 50th Anniversary where we put on a special 60s set. Dancing all night ! Some thank you notes received after gigs. Thanks again for last night you were absolutely brilliant, wish we could have had you on for another set. Will check you out if me and friends are looking for a band for any dos in the future. Thanks for making the night do ace. Sam (Sam and Lee wedding - Peckforton Castle Nov 13). just to say a Huge thank you to you and the rest of the Band for such a great night! Everyone had a fantastic time, while raising valuable funds for the School. It was great you played so late for us too - I think we would have kept you playing all night if we could. If you send me your address I'll send a letter of appreciation from the PTA. A big thank you to the Band for a fantastic nights entertainment in celebrating my daughters wedding on 19 September. The variety of music played was superb and the feedback from our guests was brilliant, you really did get the party going. Thanks for playing until after midnight it really was very much appreciated. I just wanted to drop an email to say thanks for Saturday night. Sorry that things ran over, but you guys did a great job when you finally got up. Everyone has commented that you guys were brilliant. Natalie and I had a great time too and we would recomend you guys to our friends. just wanted to say a big thanks for Saturday night. Everyone has said how awesome and enjoyable the band was. I cant wait to see you playing live again,please let me know when you are playing again. It was very special to have you and your band play for Sara and I at our wedding. The ceremony and wedding breakfast were fantastic and I was doubtful the occasion could get any better but then the Interns arrived!!! You made that night one to remember and all our family and friends have said the same. We were all astounded by the quality of your music and you certainly got people dancing faster than I have ever seen at any other wedding. We were especially amazed by the two songs that were requested that did not form part of your gig list but even so, following 10 minutes practice outside the venue, the Interns delivered each song so utterly brilliantly they will forever be a memory of our special day. Looking back now, two months on, Sara and I wish that night could have gone on forever. I am quite certain that everyone would still be dancing. I feel it is important to say that while the talent and quality of your band is outstanding, what made the night so special was your friendliness and warmth in dealing with our guests and giving them a truly special and personal experience. Thank you so much for such a great party. Anyone out there looking for a band for their wedding should book you without a single moments thought, safe in the knowledge that they can relax and look forward to a truly amazing evening. Thanks to you all. Please pass on my thanks to all the band for the music on Saturday night - you were fantastic and really made a fab evening perfect. I have had so many compliments about the music and hope that you may get some extra bookings through friends. Just can't thank you enough, so please pass on my thanks to everyone and especially you for making the organisation so easy. Just wanted to let you know what a great time we had on Saturday. again for us, as soon as we have some dates I will be in touch. looked the business but you really made it personal ... about us. to make their wedding special. when you 1st started playing right through to your last number! Thanks for playing "Time Of Your Life" for Eve & Aidan,they were well pleased. to thank you for a super night. Thanks again. Hopefully will see you again, if we have another bash I will definitely be in touch. me and saying how impressed they were with the band. Just wanted to send a big thank you, to you and the rest of the band for the fantastic evening at Wythenshawe Hall on 3rd June. Everyone was really impressed with the music and we have had loads of positive feedback. The bands performance and the range of music was second to none and it helped make for a memorable evening. Hopefully, we will get to witness your talents again in the near future and once again, thanks to you all. FANTASTIC!!! We had the most brilliant night - thank you so much! You were absolutely brilliant and so talented!! Thomas (my son) was outside the front of the house on Sunday morning cleaning his van and he said about 10 people (neighbours) went by and said how terrific the music was! They couldn't believe it was "live"!! Just wanted to say a huge "thank you" to you ALL - you made the party for me - a birthday I shall always remember. My friends want to re-live the whole night and do it all over again. You are all super stars.... I'm so glad I asked Di and Bern if they knew of any bands - it must have been fate!! Organising a band is always a bit of a lottery, you make the calls, have a look at loads of info, agree a price and cross your fingers for what turns up. Well I guess on this occasion our 6 numbers came up !. The band were professional in all aspects, especially and most important of all, the sound. The first thing anyone says about my birthday do is "what a great band". It's almost a forgone conclusion that we'll be using them again (as soon as we can think of a good excuse to book them !). The only downside of the evening......they couldn't stay to see the dawn in!! realise you could make the six string "cry and sing"! Please pass on my thanks to the rest of your band members. The standard of musical ability was extremely high. All the best for the future success of your band. 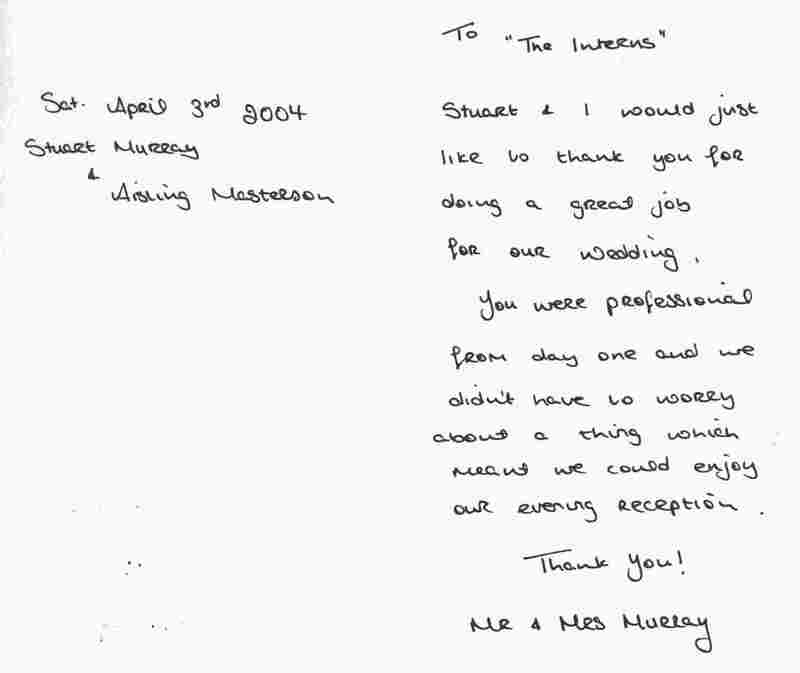 Just wanted to thank you for a super evening last saturday at mark & karen's wedding at the egerton house. everyone really enjoyed it and although we were late getting started everything went great. Once again thanks a lot and hope to speak to you in the not too distant future about a date at Unsworth Cricket club. 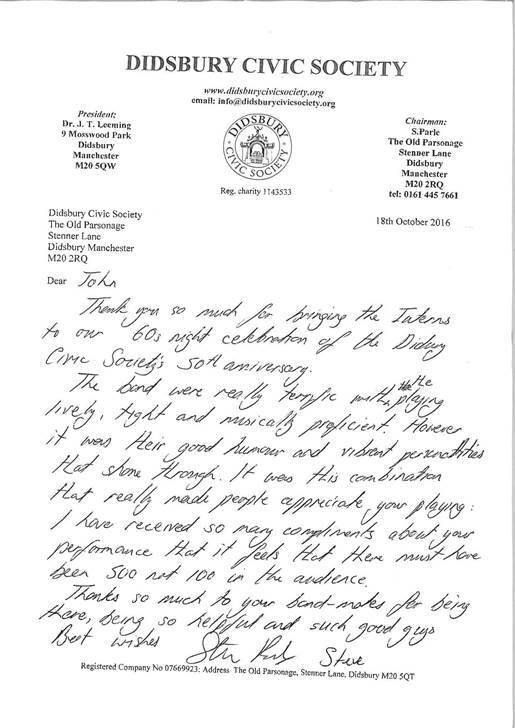 Tim, just a note of thanks for your superb peroformance at our wedding on the 30th. It was a really good bash and the singing was superb. I know that we have had a lot of positive feedback and if any of that turns into positive leads i will pass on your details. Thanks again and please pass on our appreciation to the whole band. Look forward to hearing you again one day - although hopefully not at my own weddding again!